We have algae, (that's understated - it's a large scale invasion), in our fresh water tank. And the unit stays parked pretty much 100% of the time. We don't pull it so the tanks don't get that automatic agitation. 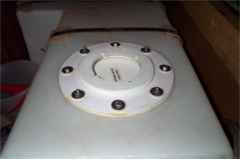 The drain on the tank is about a half-inch diameter and is positioned about an inch above the bottom edge of the tank. The tank sags in the middle another couple inches. Short of it is, there is no way I can completely drain this tank short of placing the RV on its side. And the drain hole is pretty small and the algae is pretty big too. I fish the floaters with a wire hook while flushing and pull them through when they appear at the drain hole. You might be in luck Bill! Though not installed at the bottom of the fresh water tank, there is an aftermarket add-on device called the Aqua Saver you might want to consider. You’ll have to gain access to the top portion of the tank and make sure you have enough clearance and a flat section large enough to install it. Here’s another good look at a previous installation I found online that might be helpful. Evidently, this is a home-made kit, but similar to the Aqua Saver. I installed an Aqua Saver a few years ago and it seemed to work great for that customer. The instructions state it can be installed on the top or the side of the tank, but I've seen some fairly thin-walled polyethylene tanks. I'd be hesitant to install the access port on any surface other than the very top of the tank; especially if I was accepting the installation liability. Some fresh water containers today are constructed of thin, low-density polyethylene and I'd be concerned the flexing of the sides as the tank is filled might cause leakages. But it just might be the answer to your dilemma!